Before the ball has crossed the boundary, two stumps are already plucked from the ground. Arjuna Ranatunga is looting souvenirs, no giant grin, just a smirk, then regular business. Muttiah Muralitharan is beaming as he rushes onto the field. Asanka Gurusinha is closing in like a one-man buffalo stampede. Ranatunga shoves his bat under his armpit and goes first to Mark Taylor, extending a gloved hand and polite thanks, accepting Taylor's congratulations. The invaders arrive in waves - first overjoyed team-mates, then high-strung security personnel, photographers, organisers and fans. Ranatunga is oddly stoic among the whirl of bodies, an atom's nucleus around which electrons dance chaotically. He has a slow embrace for Aravinda de Silva, wraps his arms paternally around Murali, but each new well-wisher who approaches, or shakes his hand, or hugs him, is more animated than Ranatunga. They are tousling his hair, slapping him on the back, holding his head and planting kisses on his nose. On air, Tony Greig is exultant. "This is a little fairy tale," he crows. "The thing I like about these guys is, not only do they win, they win in great style. They play the sort of cricket people want to watch. They've come such a long way in such a short period of time." Minutes later, Ranatunga receives the trophy from Benazir Bhutto and holds it aloft gently for two seconds, maybe three. Six months earlier, bookmakers had thought this a one in 66 chance. Ranatunga has just masterminded one of the greatest underdog stories in the history of his sport, yet in contrast to the unfettered joy of his men, he is so restrained he is almost smug. 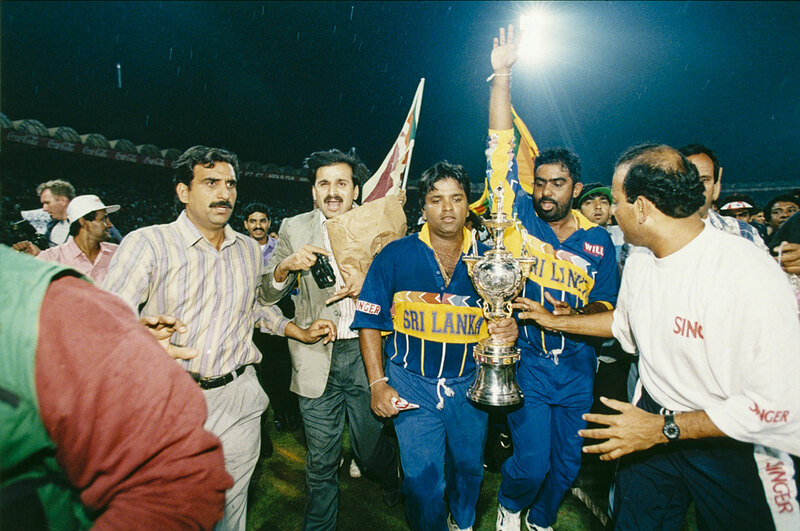 Before midnight, Ranatunga, the trophy and the team are all on a flight back to Colombo. "It's as if someone had foretold Arjuna that Sri Lanka were going to win," remembers Sidath Wettimuny, the former Sri Lankan batsman who was effectively the team's selector on tour for the tournament. "He must have been told that by an astrologer, or soothsayer or something, you know. He knew it in his bones." That Ranatunga was dead certain a team of part-time bank clerks, insurance men, and salespeople would win a World Cup suggests both vision and self-delusion, because while it was reasonable to expect Sri Lanka to turn heads, there was little to suggest they could lift the trophy. Ranatunga has raved about the experience Sri Lanka's top order carried, yet, since 1993 until the start of the World Cup, Sri Lanka won 24 ODIs and lost 38 against top-seven opposition. 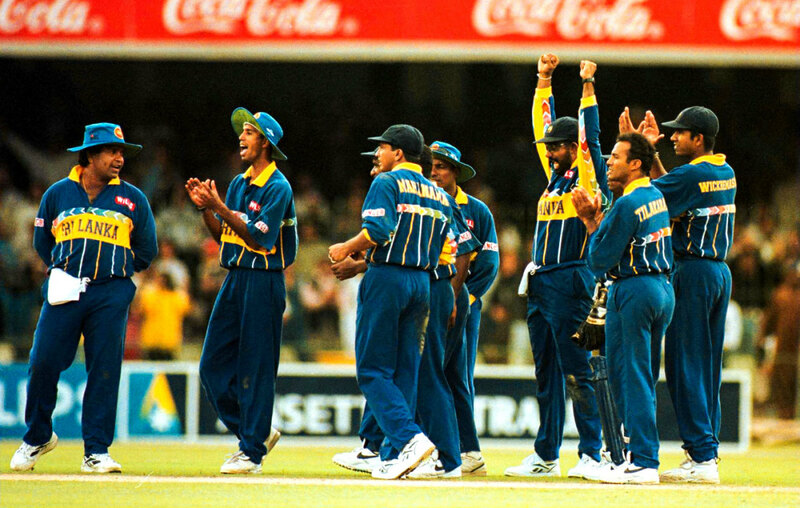 Only seven times since 1990 had Sri Lanka scored more than 250 against a top team and won. Of the spinners, Murali was averaging close to 38 against the top seven sides, and had 32 wickets in as many games. Six weeks before the first World Cup match, he had also borne the trauma of being called for chucking in front of the biggest Test match crowd Sri Lanka had ever played for. Kumar Dharmasena had three wickets at home, at an average of 54. Worst of all, the team was funded by a cricket board with little more than Rs 300,000, or around US$5700, at its disposal. Before each tour, the BCCSL (as it was then known) took a beggar's bowl to sponsors, hoping for a generous corporate to fund operational costs. Player salaries were an afterthought. Younger cricketers from outside Colombo couldn't afford rent in the city, so they relied on the kindness of friends and fellow players. 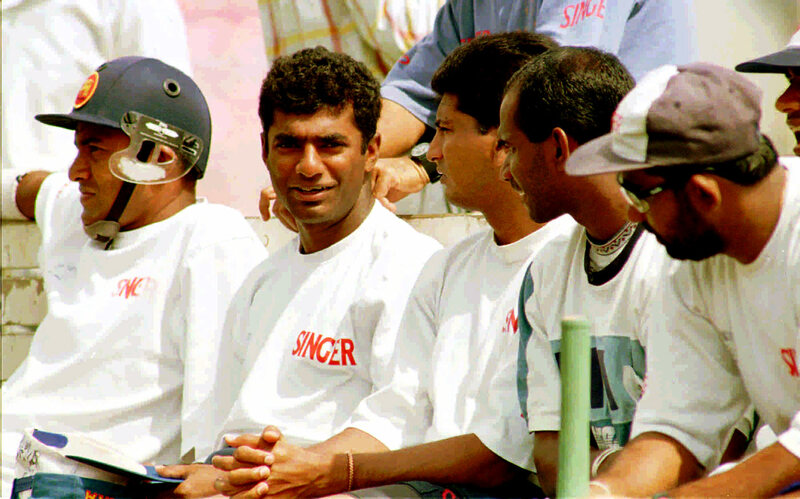 Jayasuriya and medium-pacer Pramodya Wickramasinghe were among several players who lived for months in Ranatunga's family home in Colombo's Maradana area, sharing rooms with Ranatunga's brothers. "One of the first things I remember about that is that I had to switch rooms because Sanath snored too loudly," Ranatunga says of the days his World Cup side came together under his own roof, on an Inside Sports TV show. "We didn't have everything the modern cricketers have, but my parents made sure we had enough dhal, sambol, bread and rice for the lot of us. Those kinds of things built camaraderie. We were all united. You can't get that from living and eating at hotels." When the Ranatungas couldn't make room, de Silva opened his home to Nondescripts Cricket Club mate Ravindra Pushpakumara, whose hardship persisted long after he had debuted for Sri Lanka in 1994. "Before I started living with Aravinda in Ratmalana, I didn't really see the place I lived in in Panadura during the day time, because I would leave in the morning on the 5:55am train, and would come back on the 7:35pm train," Pushpakumara says. "From NCC, I would walk the few kilometres to the Bambalapitiya train station, because that would save me a few rupees. Mostly I didn't have breakfast, but NCC gave us lunch when we practised there. When I came to the Sri Lanka team, I got a real sense that, 'This is how I can build a life.' But then, we didn't get too far ahead of ourselves." Foreign tours, especially to established Test nations, were always a reminder of Sri Lanka's place in the cricket world. Nowhere was the gulf more blatant than on the 1995-96 tour to Australia that preceded the World Cup. "Of course we were very embarrassed when we met with other international cricketers," Pushpakumara says. "Apart from my cricket gear, I would have one pair of shoes and one set of clothes. Even county cricketers and first-class cricketers had so much more than our top Sri Lanka players. "But in another sense, it made you proud also. When we went to some of those Australian grounds and you looked around at the size, and the history and the flashness of it all, you thought how great a thing it was that we were good enough to play in those places." In 1996, Sri Lanka was an insecure place in every sense of the word. 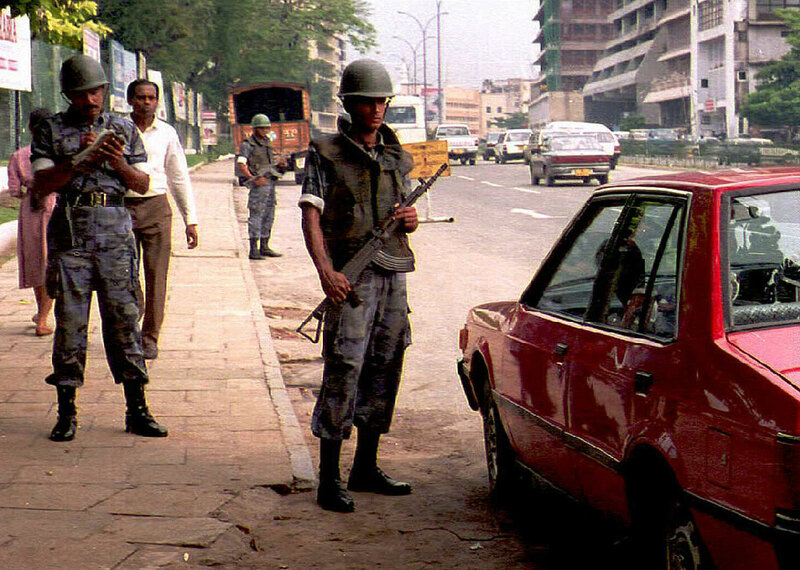 Though removed from the front lines, Colombo was repeatedly brought to its knees by violence that escaped the north and east, and took the form of bomb blasts in the commercial capital. On January 31, 18 days before Sri Lanka were to host their first World Cup match against Australia, a lorry, pregnant with explosives, crashed through the main gate of the Central Bank and detonated its payload, killing 91 and injuring as many as 1400. The city reeled. Schools were shut for the week. Office workers refused to return to the middle of town, particularly on buses and trains, which they feared would attract more violence. The government stitched its security net tighter, creating an elaborate web of roadblocks and checkpoints. More armed soldiers were deployed on the streets and public-service announcements were issued with renewed vigour, urging vigilance and suspicion. 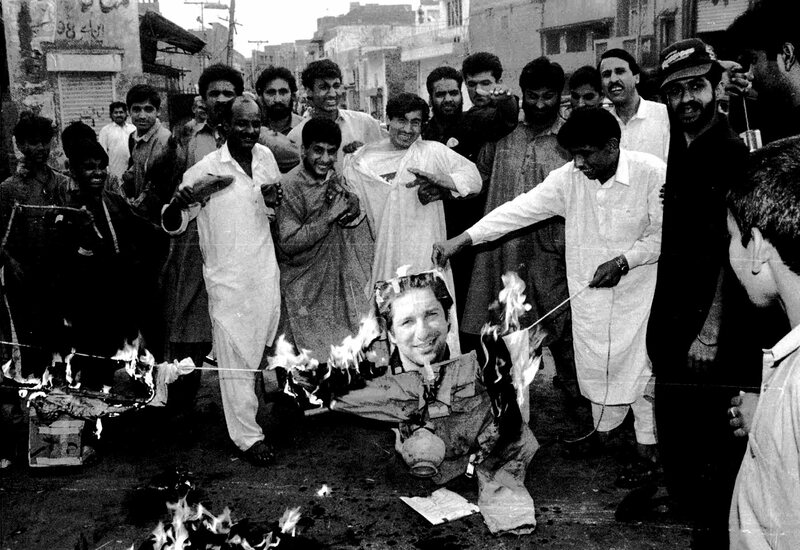 Colombo was gripped by fear, but when two cricket teams refused to travel to the city, victimisation took hold. The Sri Lankan public seethed at what they deemed an affront. Just weeks earlier, the team and their fans at home had engaged siege mentality after Murali was no-balled by an Australian umpire at the MCG. As the tour wore on, Australia's sledging was absorbed in Sri Lanka as vicious invective. This is the warped prism through which Australia's withdrawal was beheld. Unbeknown, it had been the Australian Cricket Board (ACB) that set Sri Lanka on course for World Cup triumph. They had initially agreed to A$100,000 as a guarantee payment for Sri Lanka's tour, but upon learning that the BCCSL could not afford a new coach, they doubled the sum. "Use this money to hire Dav [Whatmore]," the Australian board told BCCSL president Ana Punchihewa. "It's yours, but just keep it to yourself. Don't tell anyone." Physiotherapist Alex Kountouris' services were acquired via a smaller donation from Cricket New South Wales. Ranatunga and the selectors had put the team in place, but the dough needed kneading. These were just the men. "Dav wasn't one to tinker with techniques, but he brought two very important things to Sri Lankan cricket: method and systems," Wettimuny says. "We were players in the '60s, '70s and '80s, who were part-time, fun cricketers. Dav had a big drive to get us training and thinking like professionals. "He also brought Alex along, which is the best thing. We used to not have the necessary level of fitness to compete at the top level and that was the big difference. For example, Chaminda Vaas would get two wickets but couldn't get to the fives. The batsmen could get 40s, 50s and 70s, but couldn't get to the 100s. I remember nearly every day during the World Cup, Alex worked past midnight with all the players. He was either massaging somebody or treating somebody. Next day the boys were ready." While their board was funding Sri Lanka's backroom, the Australia team, and an umpire, were unwittingly equipping the players with a backbone and a voice. "I was standing at extra cover when Murali was called for chucking on Boxing Day," remembers Gurusinha. "Initially we thought he was called for overstepping. When we realised it wasn't for overstepping, something told me this was going to be a big problem. The person that Arjuna was, I knew we were not going to let someone control us and get away with it. "That tour, with the sledging, and the crowds and the ball-tampering allegations, we went through a lot of hard times, and that's when we started to really get the fire in our bellies." Sri Lanka's disparate shards of talent needed Australia's furnace to forge them together into a single razor tip. They were walloped in the Tests, then lost the tri-series, but came away with a new respect for themselves and for their captain. Australia and West Indies' withdrawal prompted unity at an international level. "The greatest advantage we had was that we were the little brother in the South Asian triangle," Wettimuny says, and though relations between the two big nations in the region were strained, as ever, Sri Lanka had the affections of both. Fraternal love was first felt when Pakistan and India sent a combined team to play an exhibition match. "We welcome the golden sons of India and Pakistan," read a banner near the Colombo airport. "As far as the game is concerned, we are all together," said Indian captain Mohammad Azharuddin ahead of the game. For one day, in Khettarama, Sachin Tendulkar and Wasim Akram played in the same side - their own World Cup preparations suspended, days out from the start of their campaigns. It's not quite clear when superstition began its descent into the Sri Lankan dressing room, but when it set in, team manager Duleep Mendis ensured it settled heavily. His order: when our batsmen go out, no one moves from his seat until there is a wicket. "When Sanath and Kalu were batting, we didn't even want to get up for a cup of tea," says Upul Chandana, the legspinner, who was 23 at the time. "All I remember wanting to do was to sit there and watch them bat. I had never seen anything like it." Wickramasinghe remembers a more sinister edge to the routine. "If any of us even shook in our seats, Duleep would start to shout at us. 'If he gets out next ball, you're the idiot I'm blaming,' he used to say. You know, when I think about it, a lot of our actions back then were dictated by the fear of getting an earful from either him or Arjuna." Ranatunga was the only one immune to Mendis' superstitious zeal. "I used to marvel at some of the things Arjuna used to do in the tournament," Wettimuny says. "He would field in the match, come in, get into his white towel, and when our batsmen were going out to bat, he'd go to sleep. I mean, how cool can you be? "He would then get up when two wickets fell, and slooowly get ready. Then he's ready to go. I used to get so stressed out. One day I thought I was getting a heart attack and he came and looked at me and laughed. His coolness spread a lot of confidence into that team. It just made everyone think: 'You know, this could happen.'" The walkover against Australia was followed by a straightforward victory over Zimbabwe, but it was in the next two games that belief really began to swell. Tendulkar hit a run-a-ball 137 to lead India to 271 in Delhi, but Sri Lanka rode the first of their fast starts from the openers - Jayasuriya making 79 from 76 - to a comfortable six-wicket win. Then came the stunner at Asgiriya, with qualification for the quarter-finals already assured. Against a Kenyan attack that had recently skittled West Indies for 93, Jayasuriya and Kaluwitharana powered Sri Lanka to 83 off 40 balls, then passed the baton to the seniors. De Silva cracked 145 from 115. Gurusinha compiled 84 from 103. And Ranatunga's unbeaten 40-ball 75 propelled Sri Lanka 35 runs further than the previous highest ODI total. It was while amassing 398 for 5 that an unfettered Sri Lanka discovered the full extent of their batting ability. "The beauty of the tournament for us was that once we qualified for the quarter-final, the pressure was totally off," Wickramasinghe says. "All we needed to prove was that we were in the top eight in the world. Once we did that, the whole team just relaxed. We knew whatever happened, we could face our public." On a flight to Faisalabad for the quarter-final against England, Jayasuriya is seated next to Wettimuny, both men contemplating the possibilities that hang on Sri Lanka's first entry to the knockout stages of a World Cup. "Sidath aiya," Jayasuriya says. "Whatever happens, all I want to do is earn enough money to finish my house. I just need Rs 175,000 more [around $3,300]. That's enough for me. After that I don't need anything." Wettimuny smiles. "If you win this match, you will get a lot more than that." Not long after, Jayasuriya flicks through the duty-free magazine. "Sha! Look at this watch. Beautiful, no? Cartier... "
"I tell you what," Wettimuny says, glancing over. "If you bat 15 overs in the next match, I'll buy you this watch myself." "Yes, but 15 overs you have definitely got to bat." The opener takes the challenge to heart. The selector feels that if Jayasuriya gets through the fielding restrictions, he will have scored around 50, and given the team a fine start. Everything appeared to be going according to plan for Jayasuriya when he walked in after Sri Lanka's spinners had trussed England up for 235. He launched Peter Martin through cover point, then savaged Richard Illingworth's left-arm spin for four boundaries on the trot. Phil DeFreitas was slog-swept through cow corner, and Darren Gough picked off over square leg. Jayasuriya reached 50 in 30 balls, then raised the tempo, putting a ball from DeFreitas onto a satellite dish on the roof of the stadium. After Roshan Mahanama and Hashan Tillakaratne took Sri Lanka home against England, Dermot Reeve said: "Sanath, you've ruined my career. But I'm going to go home and put £600 on you guys, so you had better win"
After Roshan Mahanama and Hashan Tillakaratne nursed the chase home in the 41st over, Reeve walked up to the steps outside Sri Lanka's dressing room. "Sanath, you've ruined my career," he said. "But I'm going to go home and put £600 on you guys, so you had better win." Almost every cricketer in the team remembers the private conversation with Ranatunga, when a personalised, carefully defined brief was handed down. "Arjuna knew I could hit sixes," Gurusinha says. "But my job was very clear. He asked me to bat through the innings." 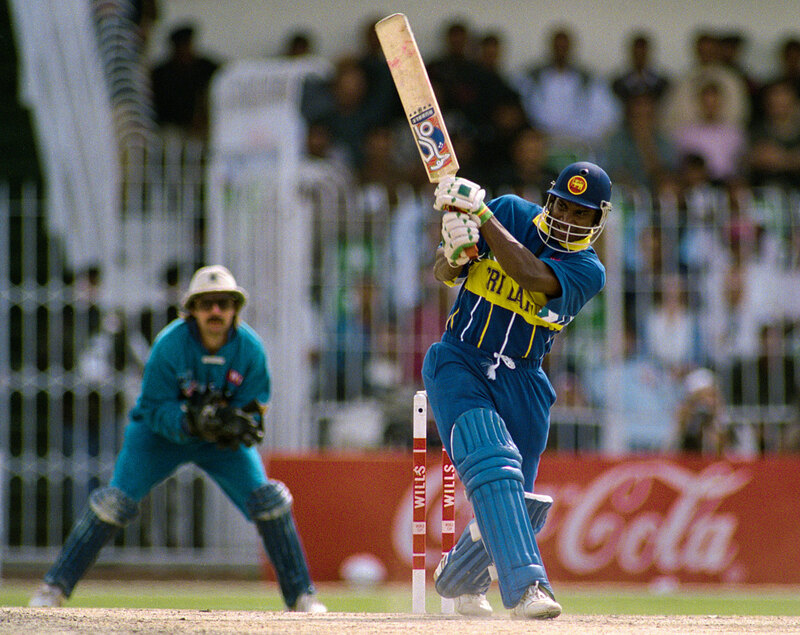 Jayasuriya had had the team's blessing to attack in the past, but once paired with Kaluwitharana, attack became his mandate. Mahanama was to turn the strike over to the swashbucklers, failing which he and Tillakaratne had to rebuild. Arjuna saved for himself the role of seeing the thing through. Sometimes the job description was so bite-sized, it bordered on the mundane. "I was there to make the new ball old," Wickramasinghe says. "It was a bonus if we got wickets, but the main thing was to squeeze. I would have a long spell - maybe eight overs. Vaasy would bowl less, and they would save a few of his overs for the death." Each spinner was pressed into service at a precise point in the middle overs. Murali was the major menace, and so was first to the bowling crease. The others - more agents of control than fizz and rip - were fed through in sequence. By the knockouts the bowlers, like the batsmen, had an order. Wickramasinghe, Vaas, Murali, Dharmasena, Jayasuriya, de Silva; like line cooks at a restaurant that serves only one dish. Quite intentionally, one man was not given a pre-tournament memo. Ranatunga had only one request for de Silva the batsman. "You get us a hundred, that's all. You win us the World Cup." In the whole operation, imagined over years, put together over many months, de Silva's was the only free hand. His was the only talent Ranatunga did not limit by the bounds of his own imagination. De Silva had been the supernova in Sri Lanka's batting galaxy for some time, but about six months before the World Cup, there were whispers he had unlocked something new. He had a summer with Kent in 1995, and somewhere during the run to the one-day final that season, he had found a way around the vagaries of his genius. De Silva would arrive just as play was starting, instructing club staff to fetch him breakfast. When the bowler ran in, he would crouch, half-eaten fish bun lodged in his fingers. "But by the end of the day, Aravinda would be 70 or 80 not out"
"He came back from Kent and suddenly people like Roshan, Hashan and Gura [Gurusinha] were talking about how Ara [de Silva] had become a different batsman almost," Pushpakumara says. "In '89, '90, '91, he had been the kind of player who would hit a beautiful 25-30 runs and then would play some crazy shot. When we were playing for the club, balls he should maybe have defended, he hooked out of NCC. That changed. He was driven. Serious." Tales of de Silva's nonchalance towards game preparation, though, are now part of Sri Lanka's cricketing lore. He had been an indifferent netter in the '80s, but even later in his career, de Silva approached his work with the resounding casualness of a bureaucrat. Partly in admiration, partly in jest, Kumar Sangakkara recounts how on many first-class match days, de Silva would arrive just as play was starting, instructing club staff to fetch him breakfast as he wandered out. A few overs in, two maalu paan [fish buns] would be delivered to him at slip. He would stash one in his pocket and chomp on the other. When the bowler ran in, he would crouch and cup his hand, half-eaten maalu paan lodged in his fingers. 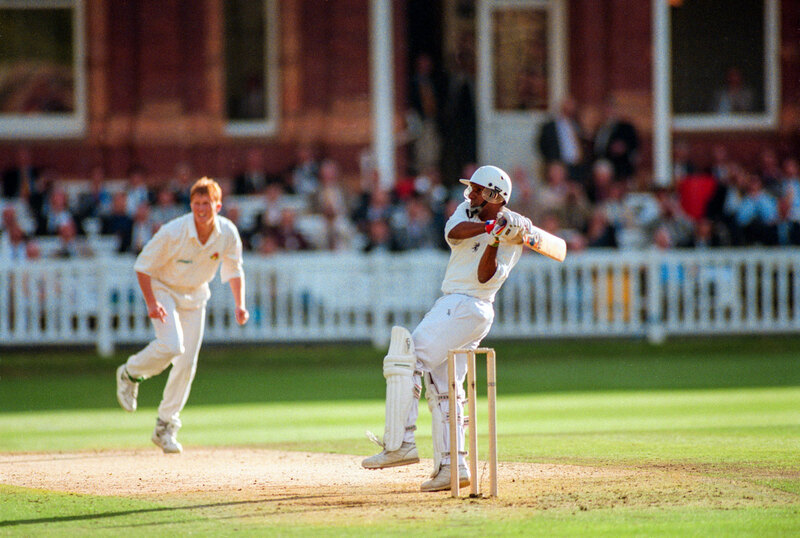 "But sure as anything," Sangakkara says, "by the end of the day, Aravinda would be 70 not out or 80 not out." All through de Silva's later career, team-mates and coaches sought to simply stay out of his way; to let him occupy his own world, where he was happy and productive. But that is not to say his cricket was without its own method. During the World Cup, Wickramasinghe remembers de Silva shadow-batting in hotel rooms for hours. "We had an 11 o'clock curfew, so a bunch of us would always be chatting late into the night, brewing endless pots of tea and coffee. But Aravinda wouldn't just sit and talk. He was always on his feet, with the bat in hand, visualising bowlers he would be facing and practising the shots he would play to them. Just hours and hours of this. Sometimes, someone would ask him, 'Ara, who are you facing now?' and he would say, 'Wasim'. 'What is he bowling, Ara?' 'Bouncer.'" Nor is it to suggest de Silva did not introspect and refine. But while others' improvement was an incremental, chartable thing, de Silva's was more like an itch that was felt in a different place from one day to the next. A new backlift would be trialled for one series, then abandoned. Next week a new stroke would be embraced, then revised, and revisited years later. "I asked him, 'What do you want to do?' He says, 'You know, Sachin uses a very heavy bat. Maybe if I use a heavy bat like this, I can just get bat to ball and it will go for four.' So he handed me this bat, and I still remember how very heavy it was. It had a nice balance and all, but he had never, ever batted with a bat like this before. He just chose it on a whim. Can you believe it? I was sceptical but I kept my mouth shut. "So he goes into the nets and starts using it. He comes out and says, 'This is the bat for me.' What am I to say, you know? This is the middle of a World Cup. But then he takes this bat into matches. What do you know - he bats like a dream." Almost every Sri Lankan over 25 could tell you the context of de Silva's 66 from 47 balls in the semi-final in Calcutta, because their team had never seen a big-match performance quite like it, and arguably, there has not been a better ODI counterattack anywhere. Sent in to bat in a tournament where they had preferred chasing, Sri Lanka lost their openers for one run, and a 100,000-strong Eden Gardens was baying. By the eighth over, Sri Lanka's top-order insurance - Gurusinha - had also been dismissed. If there is an enduring memory from the innings, it is the insane disparity between the speed of de Silva's bat swing and the velocity of the ball after he has hit it. The flick off the toes against Anil Kumble in the second over was almost dopey, but the ball skated across the turf so quick you could barely see it until it stung the boundary board. The square drive off Javagal Srinath in the 13th over was struck with such leisure, the infielders were almost surprised by how soon it scorched by. Low intensity, high impact: the heavy bat was a perfect fit for the man. When he was dismissed, Sri Lanka were 85 for 4, but having bent the bowlers out of shape and diverted the flow of play, de Silva had set them on course to 251. It would be too many for the opposition. Too much for their fans looking on. On the flight to Lahore, the players wondered which team Pakistanis would favour. Australia were not a popular team at the time, so some Sri Lankan players had reason to suggest they would have more support. No one guessed, though, that the fans, the city, the entire nation, would embrace them so willingly. Players who did not turn heads in Colombo couldn't quite understand why these neutrals backed them so energetically. Even now, it is difficult to pin down exactly why, as some players retell it, Lahoris on bikes, trucks and in hawker stalls, were carrying and waving around Sri Lankan flags on the eve of the final. Pakistan's Lanka love seemed to stem from two major factors: One - Sri Lankans were South Asians. Two - they were not India. "The day before the match, we wanted to be as relaxed as possible, so we all went shopping," remembers Pushpakumara. "I went into this carpet shop and there was this beautiful carpet there which I really wanted for my parents' place. Problem was, it cost about $500. No way did I have anything near that amount. The shop owner saw me looking and came. 'You're from the Sri Lanka team?' he said. 'Then today money is no object. You play cricket and we love the way Jayasuriya and Kalu play. Because of the enjoyment your team has given us, you can take this for free.' I was just stunned." Like the public, Pakistan's cricketers, past and present, unequivocally favoured Sri Lanka. Reigning World Cup-winning captain Imran Khan visited the team hotel to conspire with Ranatunga, then attended a nets session ahead of the game. He had told the hotel staff to look after the Sri Lankan team. He needn't have bothered. They were already being treated like kings. Ramiz Raja popped by the hotel to meet Ranatunga as well. A veteran of the Lahore circuit, he brought with him a question: "What's the wicket you guys want?" "Plenty of turn, please, medium bounce, and not too slow," was the reply. As it would turn out, the pitch at the Gaddafi Stadium could hardly have fit that brief any better. On match day, the stands were heaving with Sri Lanka flags, and anti-Australia banners. "Thing is, it wasn't even just like home support," Wickramasinghe says. "It was actually better than home support, because there was no home pressure. When you walk out in a foreign country, and you see support like that for you, you can't help but feel proud. You think, 'We must be playing good cricket. That must be why these people are here.'" Imran worried that no side had ever won a World Cup final chasing, but by now, Ranatunga's belief was all-pervading. He put Australia in. 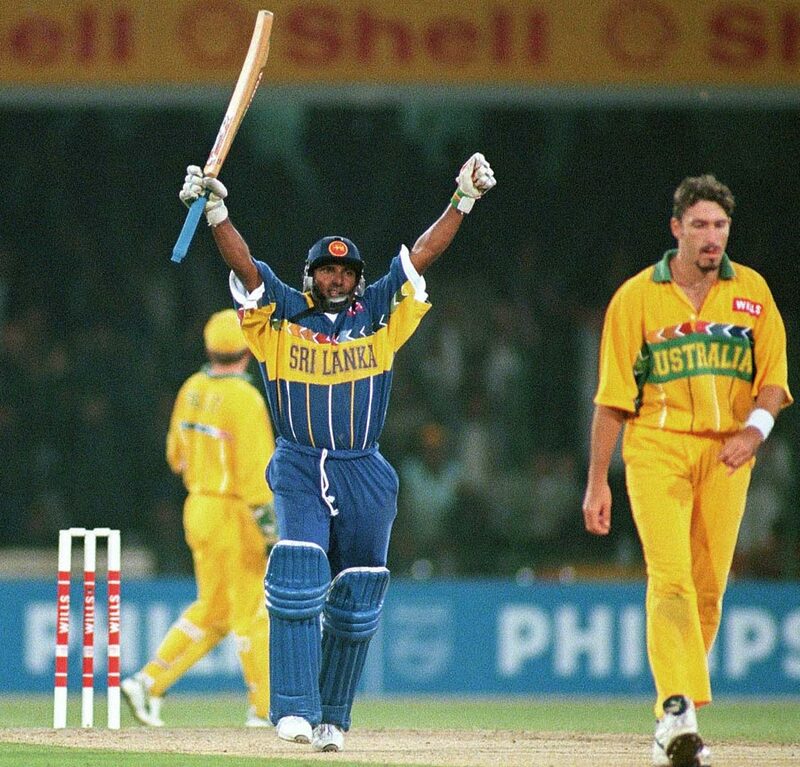 And the rest of the final was nothing so much as the Aravinda show. Vaas delivered the scalp of the in-form Mark Waugh early, but when Mark Taylor and Ricky Ponting grew the second-wicket stand to 101, de Silva shut both men down in quick succession. Taylor was caught top-edging a sweep. Ponting was bowled by one that ripped from well outside off stump. In the break between spells, de Silva took a running catch from mid-on, then another at backward point, as spin's slow poison worked on the Australian middle order. When he returned to the attack, de Silva dismissed Ian Healy with a delivery that would have done the greatest spinners proud. Tossed up into the rough outside off, the ball dived and jived to whoosh between bat and pad. Australia were kept to 241 for 7. Ranatunga led his team off the field with a strut. For an innings that lost both openers by the sixth over, the chase was too smooth to believe. The seniors had pow-wowed in the break, and loaded themselves with the job. A gum-chewing Gurusinha broke long, staid spells only to bully bowlers down the ground, reserving for Shane Warne an oozing, intense kind of disdain. De Silva was light-footed and flowing, the ball rarely failing to find the meat of his blade as he clipped to leg and drove on the rise as usual, pacing himself, and by extension, the chase. "As I descended the steps, Dav was standing there. He gave me a long, elaborate message as well, but I didn't speak English well at the time. I had no idea what he said. In the end I said, 'Okay Davvy,' and headed out. "When I got to Aravinda and Gura, I completely choked. There was so much going through my mind, but all I could say was, 'Well played, aiya' or something like that. I got back and everyone took turns asking if I had delivered their messages. Of course I told each one that I had. Dav came and asked me too - I didn't understand, but from the way he was speaking, I could tell he was asking about the message. I told him, 'Yes'. The others all believed that I had delivered the messages, but Dav was the only one who looked at me like he wasn't so sure." Perhaps Pushpakumara's meltdown was the last of a litany of improbabilities that prodded Sri Lanka towards triumph, because by the time Gurusinha and de Silva were parted, they had broken the back of the target. Ranatunga arrived with 94 to get, and helped inch Sri Lanka close, before sending Warne down the ground, then over square leg for six - one last thumbing of the nose at the cricketer who six weeks earlier had declared he would not go on holiday to Sri Lanka, let alone on a cricket tour. On air, Greig had nailed his colours to the mast early in the tournament when he had declared he loved "the way these little Sri Lankans play" - a phrase that might have been patronising on other lips; only, there was no masking the affection when he said it. As Ranatunga's six cleared the fence, Greig wrote his own legacy into the hearts of a nation: "These Sri Lankans are giving the Aussies a real hiding." The last act, of course, had to be that glide to third man - the most Ranatunga of all Ranatunga strokes. De Silva had played his piece flawlessly, but the cricket gods knew where this tale began and must end. Ranatunga had fed and sheltered his flock in the early years, watched a visionary coach and industrious sidekick fall from the sky, had his team steeled on a spiky tour down under, seen his superstar discover the depths of his talent on a jaunt overseas, and finally, colluded to load the dice with the men in Pakistan. Ranatunga was ever at the eye of this perfect storm. Maybe that's why he was so still when the thing was won.